Chart Industries Inc., Inogen, Inc., Koninklijke Philips N.V., and Invacare Corporation had a cumulative share of 65.5% in the global medical oxygen concentrators market in 2015, indicating towards a highly consolidated nature of the arena. Transparency Market Research (TMR) observes that the strong foothold of these players can be attributed to their consistent efforts of introducing a new technology in the market. Moreover, these players hold pronounced distribution networks within their core areas, which keeps them ahead of their peers. The valuation of the global medical oxygen concentrators market was US$1.25 bn in 2016 and is poised to progress at an 8.5% CAGR from 2016 to 2024, reaching US$2.41 bn by 2024. 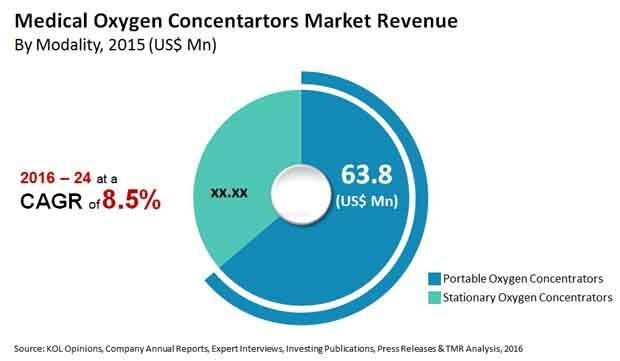 On the basis of modality, the portable oxygen concentrators segment will continue to lead the revenue generation until 2024, commanding 66.4% of the overall market. The merits of portable over stationary ones and the FAA approval for their usage in airlines in 2015 are contributing to the growth of the segment. The segment is expected to post a CAGR of 9.1% during the same period, which will be higher than the stationary segment. Geographically, North America will continue to be the frontrunner in the market until 2024, representing 36.4% of the overall market value. The growth of the region is largely supplemented by the presence of adequate reimbursement. Moreover, the domicile of key players makes healthcare facilities more accessible to the populace in the region. Patients suffering from chronic obstructive pulmonary disorder (COPD) require a continuous supply of oxygen. The World Health Organization (WHO) states that COPD will be the third leading cause of death by 2030. Therefore, the rising prevalence of the disorder is one of the primary factors escalating the growth of the global medical oxygen concentrators market. The widening base of geriatrics is another factor augmenting the market, since aged people are more prone to contracting diseases. The lightweight and rechargeable nature of portable oxygen concentrators, along with their high efficiency in purifying the air continuously from the atmosphere, is making them popular among end users. This, in turn, is providing a fillip to the global market. Moreover, favorable reimbursement policies for medical oxygen concentrators in several developed countries across the globe are working in favor of the growth of the overall market. The numerous benefits offered by portable oxygen concentrators make them costly and mostly unaffordable for a large pool of patients in developing and underdeveloped countries. This is acting as a major impediment to the growth of the market. Continuous flow technology causes wastage of oxygen, as it allows an uninterrupted flow of oxygen even if it is not required by a patient. “Continuous flow technology is the most commonly adopted technology, with more than approximately 53% of oxygen concentrators working on it,” says a TMR analyst. “Therefore, a alarge number of oxygen concentrators with this technology is anticipated to negatively impact the growth of the market.” However, the increasing adoption of oxygen concentrators in veterinary anesthesia is likely to augur well for the growth of the market in the near future.